Good news for all fans of Rebel Inc. who are unwilling to buy an Apple product only to play this game, because Ndemic Creation finally arrived on Android too. 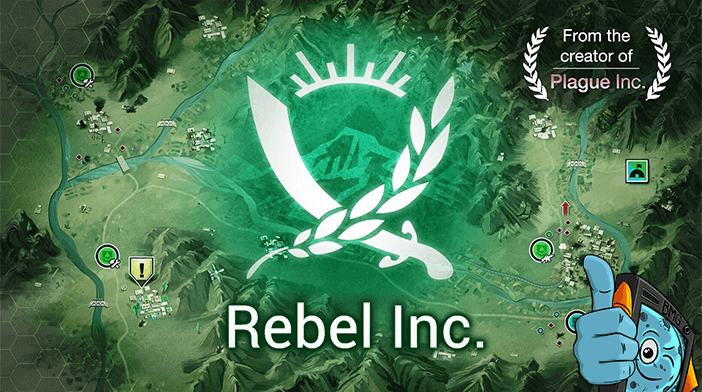 For those unfamiliar with the title, Rebel Inc. is a spiritual successor to Plague Inc, a pandemic simulator from the same development studio, that is dating way back to 2012. 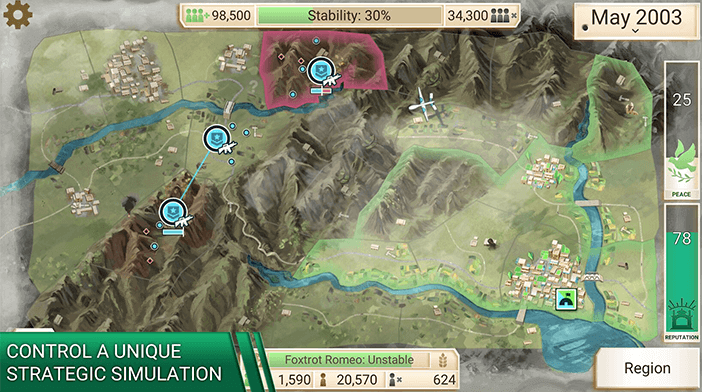 They are both strategy games but this time instead of spreading the disease around the world, you need to stabilize five regions through political and military actions. Plague Inc arrived a whole 7 years ago and Android fans grew quite impatient for the arrival of Rebel Inc, to the point that the developer was flooded with request for an Android version once the iOS version got released in December. 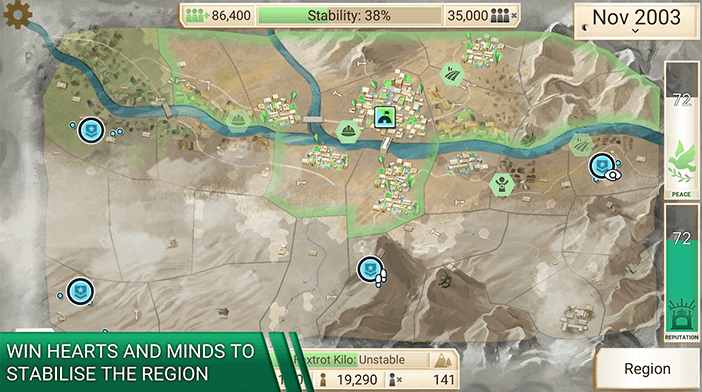 All those requests apparently worked, because Android users got their game and now they can engage in a strategic, military, and political simulation in order to calm down the regions in conflict by using political or military power in balance. Of course, that’s a lot easier said than done. You are put in the role of the governor over a small region in the aftermath of conflict, and your task is to quench the crisis that plagues the area. Putting the country back together requires a bunch of tasks, starting from mundane ones, like providing running water, electricity, and vaccinations, dealing with the insurgent forces using military technology. 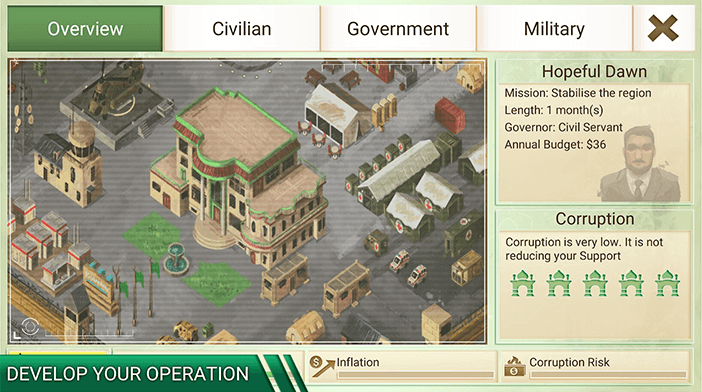 Each region is divided into sectors, and your budget used for rebuilding is assigned to Civilian, Government, and Military Initiatives. Those initiatives directly affect your ability to deal with the problems you’re facing. This turns Rebel Inc into the constant balancing act, similar to the game Kings, just endlessly more complex, with some painstakingly elaborate number crunching. Despite that, the gameplay never feels rushed, and you are free to take your time and think how would you spend money in the most rational way. Rebel Inc is a free-to-play game, so you can install it for free, however, there are also in-app purchases, some of them ranging up to $15.99 per item. Most of those purchases are used for early unlock of the game content, but there is an interesting purchase which lets you unlock the premium version of the game for $2.49. That is a good way to try out gameplay before you decide to fully unlock the game. There are various features that you will get with this unlock, some of them being the advisor to boost your operation, fast forwarding your game, fully customizable operation names (Operation Hawksucker, here I come), the complete removal of the ads and a lot more. For the last 7 years, Plague Inc piled up more than 50 million installs on Android, which is an admirable amount for that time, and for this time as well. Meanwhile, the mobile games evolved greatly and it is justified to raise a question will Rebel Inc. will find the success of its predecessor, considering there are many more options on the Play Store then there were back in 2012. Fortunately, the pricing model for this game is fair enough, and it includes a complete unlock, which makes this title very desirable for all the fans of Plague Inc.
← Walkthrough for Part 2 of Let the Festivities Begin Adventure is out! ← Walkthrough for Part 3 of Let the Festivities Begin Adventure is here!